An enormous machine roared to life to pulverize one ton of illegal elephant ivory tusks, trinkets and souvenirs in the heart of New York City today. The ivory crush in Times Square sent a dramatic message to the world that the United States will not tolerate ivory trafficking. The government-led event was open to the public. WWF welcomed news of the crush but continues to push for strong regulations to end commercial ivory sales in the United States. We’re asking the US government to urgently move forward with pending regulations to tighten existing loopholes that enable the laundering of illegal ivory in the US. But laws alone cannot stop wildlife crime. The government also needs to enhance and fully enforce ivory legislation, and we must all work together to curb demand for ivory. Behind every piece of ivory is a dead elephant. Any purchases or sales of ivory only fuel the current poaching crisis. Despite a ban on international commercial trade in ivory since 1989 through CITES, an international treaty that regulates trades in wild flora and fauna, there remain considerable challenges to enforcement within the United States. This includes widely varied state laws and a federal loophole that allows those who owned ivory before 1989 to sell it legally. Wildlife criminals take advantage of this loophole to pass off recently poached ivory as pre-ban carvings, jewelry and other trinkets. The ivory crush in New York reinforces the US stance against wildlife trafficking, both at home and abroad. The government crushed one ton of ivory comprised of full and carved tusks and hundreds of ivory trinkets that was seized from a single store in Philadelphia in 2009. This follows the 2013 destruction of six tons of confiscated ivory by the US government. Earlier this month, the Philadelphia store owner was sentenced to 30 months’ imprisonment followed by two years of supervised release for smuggling elephant ivory. 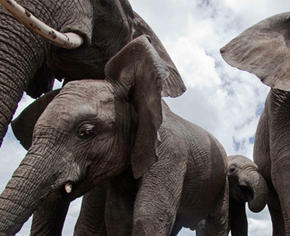 He was also fined $7,500 and had to forfeit $150,000 along with the approximate one ton of ivory. Join WWF in asking the US government for strong new rules that leave no potential loopholes for criminals to exploit, as well as much-needed resources to ensure that regulations are effective.